Use Candles to achieve Happiness, Bring Love, Increase Fortune and Success! For thousands of years, people from all religious backgrounds have included candle burning in their rituals to achieve a goal. This is not limited to any one religion or tradition, but has been found to be effective all around in using energy to attain what you want. And now you can do it too! Easily, effectively, and quickly. Candles are one way that you can achieve many goals quickly and easily. 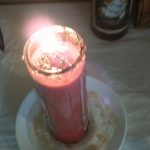 Candles release small but STEADY streams of spiritual POWER designed to help you in attaining your goal. Take a moment to imagine a brick under a dripping faucet. That brick is your only obstacle between you getting what you want. That water is the energy you are sending to break the brick so that you can get what you want. You know that A few drops of water won’t break it. But you also know that with a slow steady stream of water (energy) hitting the same spot on the brick, the brick will eventually crumble and break. And you will be able to reach your hand through and you get what you want. That is how our Blessed Candles do for you! We will send you the proper prayers and invocations which will call upon the Spirit that specializes in your particular goal. Helping you blast through the issue and get what you want. I’m telling you, if your smart, you really want one of these candles working for you! Our Candles are prepared with High Quality Spiritual Oils, Essences and Herbs that get the ball rolling to jumpstart the achievement of your goal. Simply pick the candle appropriate to your goal and order now. For particularly stubborn, long standing problems, we recommend that you burn candles in rows or sets. What this means is that you light a new candle when the old candle goes out. We have many people who love doing this and find it very effective at achieving progress in their situations.